Starrett recounts what it was like seeing William Gillette on the stage in Sherlock Holmes. 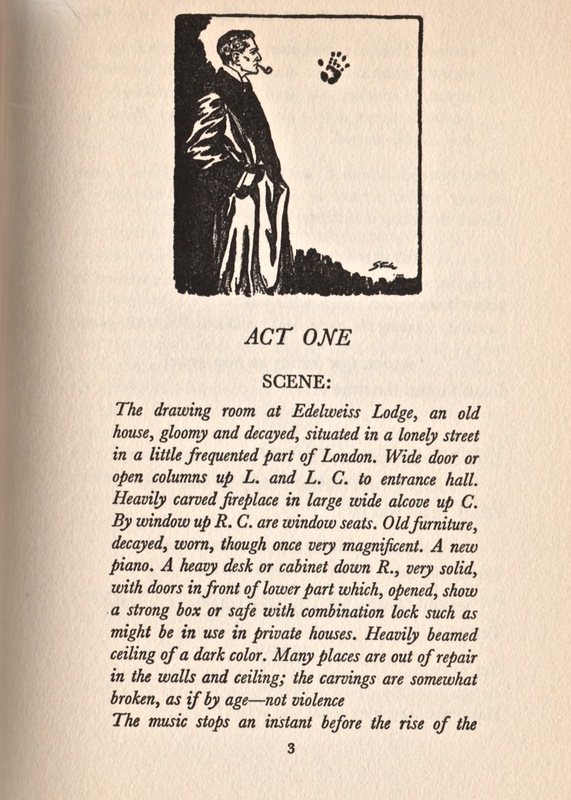 The frontispiece of the 1935 edition of Sherlock Holmes: A Play features a sketch of Gillette by Steele. It's as handsome an illustration of the great actor as was ever done. With all of the (justifiable) excitement about the discovery and restoration of the film “Sherlock Holmes” starring William Gillette, I thought it might be a good time to pull a few books relating to that great actor off the shelves. First among them must be the lovely piece of work from Doubleday, Doran published in 1935. Gillette was 81 at the time the book was published and his play had passed into legend. His portrayal of Holmes was a revelation in 1899, when the Baker Street sleuth came to the stage as a dashing, handsome man of action. Gone was the rail thin Bohemian who languished for days before the fire. Here was Holmes as rescuer and romantic, able to outwit Moriarty, bedevil Watson while in disguise and clutch a swooning maiden all in an afternoon matinee. Starrett first saw Gillette in his most famous role while a high school student in Chicago. He recalled going to the theater with his friend, Jack Chandler, and the excitement they felt when the great man’s melodrama rolled into town. This is from his memoir, Born in a Bookshop. The title page. Look at that lineup of talent. Wouldn't you just love to have these three men in the same room and listen as they exchanged stories? Owning this book is the closest you or I will ever get to that opportunity. Starrett’s love for Gillette in the role of Holmes knew little bounds., He writes that he was not alone in his estimation of the actor’s power to uplift a shaken nation who had seen Gillette during the Great Depression on his final tour. For Starrett, the play was the true fountain of youth. When Gillette rolled into Chicago in 1930, Starrett eagerly got a ticket—but not without a little trepidation: Would the old play hold up after all these years? Did Gillette still have the power to transport an audience? Starrett called the old play “a memorable and completely satisfying chapter of entertainment.” He lovingly ruminates about the play’s history and even gives a thought to the film, which has recently generated so much excitement. If memory serves, the original to this is in the University of Minnesota's collection. There is considerably more here, — the essays by Frederic Dorr Steele and Gillette himself are invaluable, and I recommend you hunt down one of the various editions of the play. The 1935 original is preferred, of course. It has all the various elements you would want. While I would have loved some photographs of the play or a reproduction of the final tour playbill cover, the few, small line drawings by Steele that pop up at the beginning of each act lend a certain authentic flavor. Certainly the dust jacket is worth the price of admission. It is Steele at his melodramatic best, showing Gillette as Holmes in silhouette, surely in contemplation of some great mystery. The figure is a little stooped, perhaps, as age and arthritis have taken their toll. Nonetheless, the great profile is there in deerstalker cap and pipe. This is the stamped cover of the 1935 original edition by Doubleday. Look closely and you'll see the profile of Gillette as Holmes. Compare this with the dust jacket from the same edition. And while it’s hard to see, that same image is stamped on the cover of the book itself. A very nice touch that would never be repeated today. On the back of the wrapper is a happy advertisement for The Complete Sherlock Holmes, the two volumes for only $3.75. (Well, it WAS the Great Depression.) The fact that the copywriter has erred in counting the number of “full-length stories” from Doyle’s pen (oh that there were six rather than four!) means little. It’s a delightful addition, since we know it includes Christopher Morley’s fine introduction. The 1976 Doubleday edition has the text of the play, but lacks all of the other special material of the 1935 edition. If you can’t find the 1935 edition, cast about for the 1974 reprint, published by Helen Halbach of Santa Barbara, California. Published just after the death of Starrett and as the Royal Shakespeare Company’s revival of Sherlock Holmes was still making waves, “there seems to be no better time to present a company of old Sherlock Holmes admirers to an audience of the new,” as the publisher notes. It’s a bully job of reproduction, done from the Doubleday Doran plates, including the illustrations and dust jacket. The printing techniques of the ‘70s do an acceptable job with Steele’s line drawings, which retain their crisp and clean look. The volume was done in a limited edition of 1,000. It’s a keeper. One word of caution: Doubleday & Company produced a 1976 edition of the play, but it has none of the wonderful essays or illustrations that make the earlier Doubleday and Hallbach editions so evocative of the era. If all you want is the script, it’s okay. But really, don’t you want to sit with Starrett as he recalls the thrill of being transported back to his boyhood?